This present pope—Francis—is probably the most powerful man in the world. Francis has much more power, maybe because of the strength of his convictions, than any of his predecessors, with the exception of the Polish pope, John Paul 11, who played a frontline role in triggering the events that brought down communism. John Paul 11 set his sights high. How could this youngish pope have such an impact? It was drive, personality and an intuitive knowledge about how power worked. He was also enormously charismatic and could summon up a crowd of half a million people with the click of his fingers—or so it sometimes seemed. Francis uses his power and crowd-pulling charisma for a different cause: to help the poor, the dispossessed and the suffering. Traditionally, popes have stressed the value of the Church’s edicts on divorce, birth control and the confession of sins. At one time, not very long ago, it concentrated on propagating belief in far-out concepts like infallibility, angels, limbo and purgatory. Maybe Francis believes some of this but it isn’t what he likes to talk about, as his predecessors did. When he was the new Archbishop of Buenos Aires he still rejected liberation theology with its strong socialist content that embraces the so-called “preferential option for the poor.” He came to change his mind. The poor and this philosophy are now the centerpieces of his work. But did that make him a through and through good man? A long and thorough study of his earlier life as the superior of the Argentinian Jesuits, a bishop and finally a cardinal will yield a conclusion as to that question. In that period he shunned for most of the time being outspoken about the appalling abuses of the military government, despite many Catholics being tortured or having their small children confiscated. What he did do was to help on the quiet: sheltering people on the run and intervening with the authorities about particular prisoners. In this sense he was the opposite of his counterpart in Brazil who was also under the thumb of a military regime. Cardinal Paulo Arns of Sao Paulo took the government head on publically and as a result was very much a major contributing influence in ending the regime and turning Brazil toward democracy. The full story has not been told elsewhere. In a new book, Absolute Power, the space given to it is fairly brief. 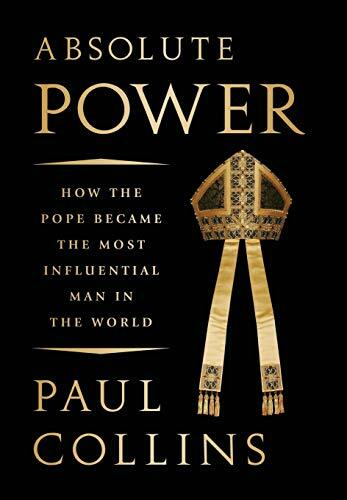 The author, Paul Collins, does the same as the three authors who published major studies of the Pope before Collins’s: playing down this aspect of Francis’s life. If only modern day popes could see war like this, given their immense charisma, they might well have had a real influence on stalling the wars in Vietnam, Central America, Afghanistan, and Iraq. Today Francis often speaks about contemporary foreign affairs. But as he shouts from the rooftops about aiding the poor so must he more loudly lead Catholics against war. He did take on President Donald Trump during the election for unchristian behavior (which, strangely, Collins doesn’t write about) but obviously his attacks were not often enough or deep enough to persuade many Catholics not to vote for him. If Francis could be more outspoken, not less, then, despite the inadequacies in part of his earlier life, he could become to be seen, perhaps, as one of the greatest of all popes. He has not made himself the most influential person on earth for nothing.